aśanam — this food; me — mine; vasanam — this cloth; me — mine; jāyā — this spouse; me — mine; bandhu-vargaḥ — these relatives; me — mine; iti — thus; me me kurvāṇam — while uttering the sounds ‘me’, ‘me’; kāla-vṛkaḥ — the fox of time; hanti — slaughters; puruṣājam — the goat-like attached soul. Suppose a person driving a car to a shopping mall becomes infatuated with dreams of buying various things. If they become so infatuated that they don’t even notice that their car is headed towards a cliff with a deadly fall, they will soon meet with a disastrous end. Similar is our fate when we become obsessed with worldly possessions. We can’t see the reality that our life-span is finite and is being depleted with every passing moment. While we live thus blinded, death suddenly comes upon us as a fearsome predator and dispossesses us of everything. 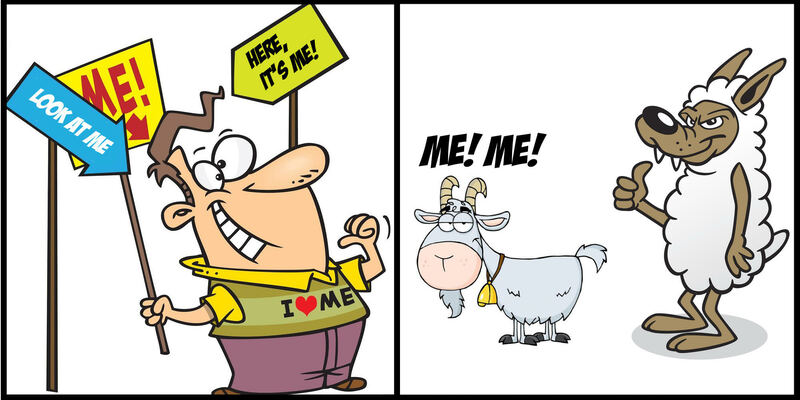 A goat is often used to depict those unintelligently obsessed with small things while being oblivious to big dangers. The Bhagavad-gita (16.13-15) outlines how the possessive mentality can make people ungodly, even demonic. We may not stoop to demonic actions, still the mentality of wanting more and more is obsessive and spiritually destructive – it deadens us to our spiritual potential and perpetuates our distressful worldly existence. What to speak of infatuation with future possessions, even infatuation with our present possessions can consume our consciousness. In fact, anything we possess can possess us. Just as a ghost may possess a person, driving them to act self-destructively, so too can our possessions infatuate us, making us act self-destructively. As long as we are infected by the possessive mentality, our consciousness stays caught in the external things that we fantasize about getting or worry about losing. Thus, our obsession with possession of externals causes us to lose our most fundamental inner possession: our own consciousness. External possessiveness leaves us internally dispossessed. When we detach ourselves from obsession with possessing things, we become possessors of our own souls – the Gita (02.46) refers to such people as “atmavan,” which translates literally as “possessors of their souls.” Our soul – its essential energy of consciousness – comes in our control so that we can intelligently choose where to invest it. Most spiritual paths ask us to give up the possessive mentality. Devotional spirituality, however, is so inclusive that it channels even the possessive mentality. Bhakti wisdom explains that we are souls, who are eternal parts of Krishna (Gita 15.07). He is the all-attractive whole, and we are meant to delight eternally in pure spiritual love for him. Love naturally means that the lovers possess each other; their consciousness stays absorbed in their object of love. Of course, love is first and foremost about giving oneself. When we give our consciousness to Krishna, he enters through our consciousness to occupy center-stage in our heart. The Gita (09.29) states that those thus devoted reside in Krishna, and he resides in them. Those who attain such spiritual absorption realize that no gain can ever supersede this gain; they don’t let any loss, however grave, distract them from this gain (06.22). In being absorbed in Krishna, they gain him and thus gain everything, for he embodies in full the attractiveness of everything that is worth possessing (10.41). While we may be far away from such realization, we can progress towards it by offering our consciousness to Krishna through the practice of bhakti-yoga. Moreover, bhakti wisdom redefines our relationship with our possessions – we see our role as trusteeship, not ownership. We responsibly take care of our obligations and relations, but in a mood of service to our Lord to whom everything, including we ourselves, belong. Working in this devotional service mood raises our vision above time’s relentless advance to Krishna’s tireless grace in our lives, in the many opportunities he provides us to connect with him. When we gratefully accept his grace, he ultimately delivers us out of the material world that is within the domain of time to his eternal ecstatic abode that is forever beyond the clutches of time.